The Golden Spoons: Hey Mom! My kids have a new mantra. 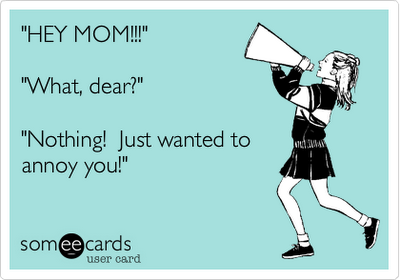 It's "Hey Mom" and they must say it about a million times a day. Almost anytime they speak to me, their question or statement is preceded with "Hey Mom." For example, they might say, "Hey Mom! What are we having for supper?" or "Hey Mom! Can we get in the pool?" or "Hey Mom! Can I use your computer?" or "Hey Mom! Look at this!" or "Hey Mom! I'm out of toilet paper!" or "Hey Mom! Can I have a snack?" I'm sure you get the picture here. Annoying, isn't it? Many times, they spout this phrase when it is entirely unnecessary, such as when we are riding in the car - just two of us- or when I am the only other person sitting in the room with one of them. There is nobody else to whom they could possibly be speaking. Yet, they still feel they must always begin with "Hey Mom" when addressing me. I've tried this approach myself, saying things like "Hey Megan! Clean up your room!" or "Hey Rachel! Turn off the TV!" or "Hey Emily! Time to get out of the tub!" Surprisingly, though, addressing children this way does not seem to be particularly effective. Very rarely does this method add enough extra emphasis to make them actually follow my instructions. In fact, they are often able to ignore me completely despite my "Hey Kid" beginnings. Perhaps, I am just not executing it properly. Maybe, after I hear it from them about a bajillion more times - and I'm sure I will - I'll figure out what I'm doing wrong! "Hey Reader!!" I sure would appreciate a vote!! Thanks!